Want to increase the efficiency of internal transportation tasks? The extended payload MiRHook mobile robot can fully automate pick-up & towing of carts, while being user friendly & efficient. How Can the MiRHook Improve Your Facility? The MiRHook is perfect for a variety of towing jobs, and can efficiently move heavy products between locations. Perfect for manufacturing facilities & warehouses, moving linen or food carts in hospitals. The MiRHook robot autonomously picks up and unloads carts up to 661 lbs (300 kg). The robot identifies QR codes and transports them as programmed. It can be incorporated into a fleet, easily redeployed, and you can easily update the robot’s mission at any time via smartphone, tablet, computer & Bluetooth. MiRHook also safely and smartly maneuvers among and around people. Simply measure the cart and upload the data into the software. The built-in sensors & cameras allow the robot to avoid people and objects, and it can even drive up ramps. 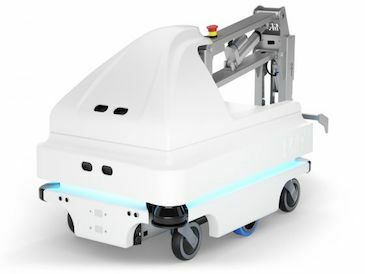 Collaborative mobile robot with a hook for fully automated pick-up & delivery of carts up to 661 lbs (300kg).